It is the late 1950s. Flourishing under the economic miracle, Germany grows increasingly apathetic about confronting the horrors of its recent past. Nevertheless, Fritz Bauer doggedly devotes his energies to bringing the Third Reich to justice. One day Bauer receives a letter from Argentina, written by a man who is certain that his daughter is dating the son of Adolph Eichmann. Excited by the promising lead, and mistrustful of a corrupt judiciary system where Nazis still lurk, Bauer journeys to Jerusalem to seek alliance with Mossad, the Israeli secret service. To do so is treason — yet committing treason is the only way Bauer can serve his country. 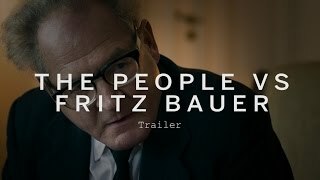 You can buy "The People vs. Fritz Bauer" on Apple iTunes, Plejmo as download or rent it on Apple iTunes, Plejmo online.